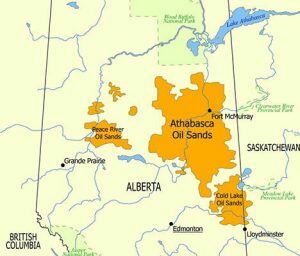 Only 20 per cent of the oil sands resource is located close enough to the surface to be mined (this resource is concentrated such that 20 per cent of the total bitumen in the oil sands occurs in an area of just 2.5 per cent of the geographic extent of the oil sands). Using truck and shovel technology, the oil sands are transported to a processing facility where hot water and a small amount of caustic soda (i.e. “soap”) are used to separate the bitumen from the sands and clays. Once the bitumen has been recovered, the remaining sands and clays are sent to a tailings pond – often a discontinued mine pit. The tailings are a mixture of water, clay, sand and residual bitumen. In the tailings ponds, the sand and clays settle and the clarified water is recycled back to the processing facility. More than 80 percent of the water used is recycled. Tailings are strictly regulated by Alberta Environment and the Energy Resources Conservation Board. The ponds are carefully designed with seepage collection and containment systems. The groundwater is monitored to ensure it is not affected. In-situ production is used to recover deposits that are located more than 75 meters underground. Most in situ bitumen and heavy oil production comes from deposits buried more than 400 meters below the surface of the earth. Cyclic Steam Stimulation (CSS) and Steam-Assisted Gravity Drainage (SAGD) are in situ recovery methods, which include injecting steam through vertical or horizontal wells. The thick bitumen is heated so that it is able to be pumped to the surface through the wells. In-situ operators generally use non-potable or even saline ground water and they recycle 90 per cent of the water they require. Other technologies being tested such as THAI™ could have commercial application in the future. This new form of in-situ technology uses air instead of water to heat up the bitumen. This technology uses little natural gas and minimal water while producing 50 per cent less greenhouse gas emissions. Similarly, the injection of solvents such as propane, show promise.